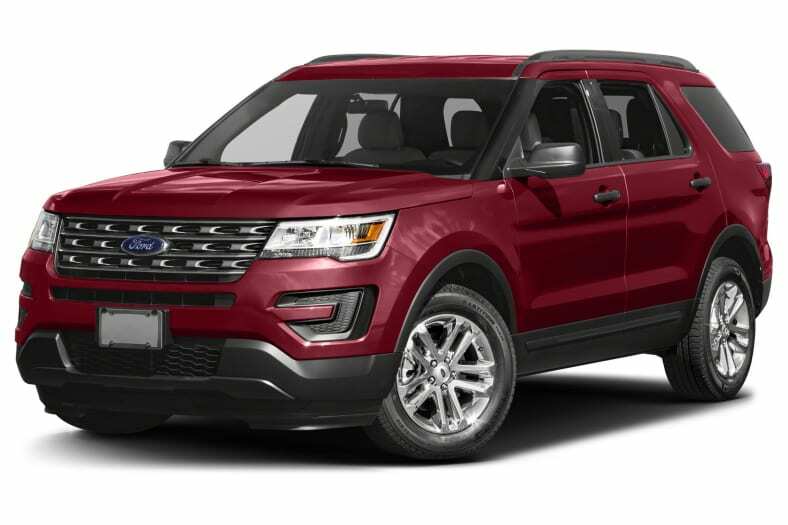 With its 113-inch wheelbase, the Ford Explorer is bigger than it's ever been, about the same size now as the Chevy Traverse and Honda Pilot. Explorer looks rugged, but that's deceiving. In fact, it should be viewed as a front-wheel-drive or all-wheel-drive family wagon. It's not rough and tumble like it used to be, back in the day when it was body-on-frame, and had locking hubs and a low-range transfer case. With the right options, today it can tow 5000 pounds and seat seven people, but so can the Kia Sorento. For 2016, Explorer got a light re-do, including smoother bodywork, nicer and quieter interior, new available engine, and Sync 3 infotainment system. For practical purposes the generation stretches back to 2011, when it went crossover. For 2017, Explorer offers a new Sport Appearance Package for lower trims, rendering a more aggressive look with 20-inch wheels, a gray grille insert and black cladding, black roof rack, and gray leather seating with gray suede accents and contrast stitching. Otherwise, it carries over unchanged. Base engine is a 3.5-liter V6 that's used in many other Fords, from Flex to Fusion. It makes 290 horsepower and 255 pound-feet of torque, and can accelerate to 60 miles per hour in about 8.5 seconds, using the standard 6-speed automatic transmission. It comes as front-wheel drive but all-wheel drive is available on upper models. A popular engine is the four-cylinder 2.3-liter turbo, available on some models and standard on Explorer Limited AWD. This EcoBoost four can be found in the Lincoln MKC and Ford Mustang, and in the Explorer makes 280 horsepower and 310 pound-feet of torque. It's better than the V6 in every aspect, including the sound that comes from the tuned exhaust system. The most powerful and most fun engine is a twin-turbocharged 3.5-liter V6 making 365 horsepower and 350 pound-feet of torque, in the Platinum and Sport AWD models. If they made an Explorer SHO it would have this engine. The Explorer Sport with this twin turbo V6 gets 20-inch wheels, bigger brakes and a stiffer chassis, but it's still a long way from the Jeep Grand Cherokee SRT. Naturally, fuel mileage for that engine is the lowest of the three, at an EPA-estimated 16 City, 22 Highway and 18 Combined miles per gallon. The base V6 doesn't do much better, at 17/24/20 mpg, while the EcoBoost turbocharged four 19/28/22 mpg. It's worth noting that many EcoBoost buyers complain that their mileage doesn't match the EPA rating. The Explorer earns five stars in its NHTSA crash rating in every category except rollover, but we can't think of any tall SUV that gets five stars there. With the IIHS, the Explorer got top scores in the moderate-front overlap, side impact and roof strength tests, but only Marginal in the small-overlap crash test.